A few days back I reviewed a slinky pair of Mavic Heluim bib shorts, and being as we had the jersey to match I figured a prompt follow up would be in order, but is there any way they could match up to the excellent shorts? Ok, to start with I have to admit that I've been wearing the shorts for a lot longer than the jersey - I hadn't really had chance to slip into the white and bright jersey, partly because as much as I do love white, maybe even more than black - I also fear the laundry burden, and having had dirty roads and trails to ride over the past weeks I kept this one for a dry and clean spell. This "white knight" ride armour comes in white, or even white with a grey-white front and black under and overarm slashes, all trimmed with the trademark Mavic yellow, a sublime, classy, and yet recognisable colour scheme, which is growing on me more and more. It's not in your face, or pretentious, it's just - stylish, but without any bold statement about it. It's made for wearing, to do a job, and to do it well. 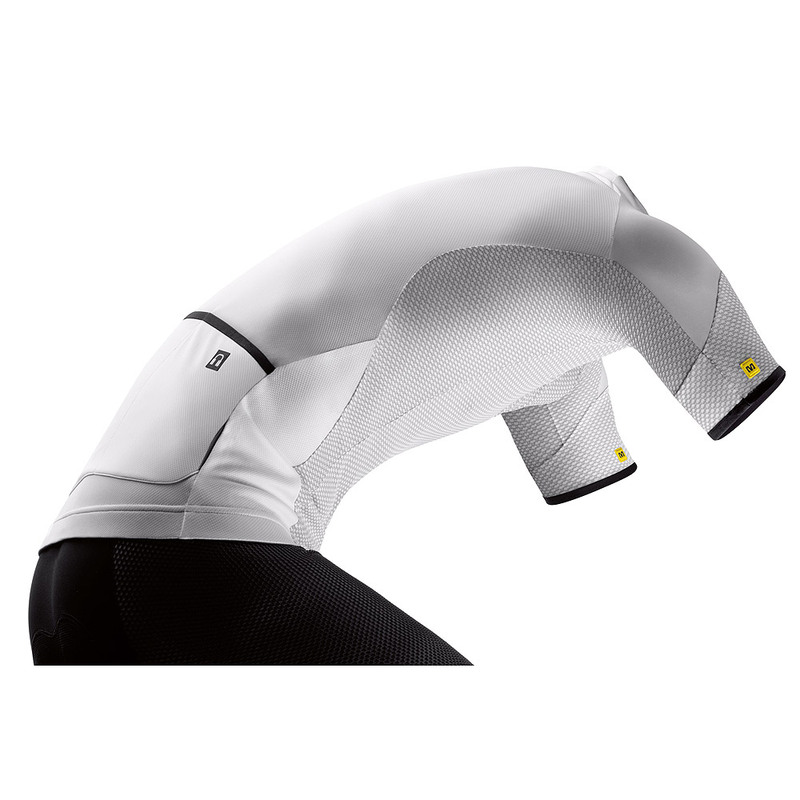 Once again Mavic have gone to work with serious intentions here; this jersey is super-light, and very fast drying - stop off for a coconut and it'll dry out faster than a barrel of free beer, which is ideal in any weather, and especially in the hot weather that it's really designed for. The back of the jersey is fairly standard and practical stuff, made from a 50% Polyester based and high wicking fabric, and comes adorned with three regular rear pockets, and a "drilled out", seemingly obligatory, iphone earbud cable hole. The base hem of the jersey is sturdy and elasticated, with small and grippy inserts; but the real genius of the jersey comes from it's full-frontal, and under-arm air-con. The entire front, the under arm section, and a large slice of the sleeves, are made from what they call "Sleek Wick ST". In practise this is a stretchy and mottled material, which comes is close being semi-see-through, almost mesh like, hence highly breathable, all of which is pulled together by a full length zip. Once it's on you'll hardly notice that you're wearing this jersey; it's a snug and comfortable fit, and the lightweight and mesh like frontal "air-con" kicks in like a dream - it works. It's no ice pack, but it definitely vents well and allows the sweat to quietly wick away. It also has UV protection, so you won't compromise those hard earned tan-lines or end up looking like a mesh curtain. The bottom line - I'm becoming way too fond of this Mavic kit, I wish they'd send me something sub-standard to groan about, but I can't see that anywhere right now. This is a super comfortable, stylish, fast drying, highly ventilated jersey. It's hard to even think about pulling on a regular custom kit strip once you've tasted something genuinely this good - a great hot-ride jersey.